100% Indian Temple Hair. Ethically sourced and traceable, guaranteed. It has been estimated that of the 1000 tons of human hair shipped into the US every year, only 25% is from known ethical sources. With no current regulatory body demanding ethicality in the hair extension industry, the salon industry and the consumer has had no guarantee that the hair extensions they chose were traceable, ethical or of good quality – until now. Great Lengths sources the very best human hair from Indian Hindu Temples. The hair has been donated willingly by villagers to the temple as an act of devotion to their faith. The revenue generated by Temple Hair is used for the funding of schools, health clinics and other community services. 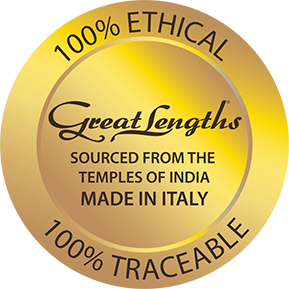 When customers see the Great Lengths Setting Fair Standards Seal, they can rest assured that the hair used is 100% traceable, ethical and of the highest quality. A fair and reasonable price is agreed for the hair and the money used to procure the hair is used solely for charitable endeavors, not for personal or individual profit. A company representative has procured the hair to cut out unreliable middlemen and ensure full and direct knowledge of the origin of the hair. Exclusive in-house production processes are used from procurement of the hair to wholesale selling to ensure full traceability. Great Lengths hopes that the Setting Fair Standards Seal will pave the way to unified ethical regulation of the hair extensions industry. Patented synthesized keratin protein polymer that attaches hair to hair on a molecular level. In 1992, Great Lengths International developed and patented the first pre-tipped, synthesized keratin bond polymer. Because of this ground breaking technology, many extension companies now claim a “keratin bond” as their form of attachment. Any form of keratin can be combined with any type of polymer to qualify as a “keratin bond,” regardless if it makes any functional difference in the bond itself. Unfortunately “keratin bond” has become more a marketing term than a functional benefit. The GL Synthesized Keratin Bond molecular structure is specifically designed to mimic the molecular structure of human hair. The result gives the GL bond functionality that is not available in any other hair bonding compound in the marketplace. The GL bond has the ability to expand and contract mimicking the human hair it’s bonded to. For example, when hair gets wet, the hair shaft expands. When it dries, it contracts. Bonds that do not possess such function will soon begin to shed the extensions and ultimately slide off the client’s natural hair completely because the bond is being stretched with no capacity to contract each time the client’s natural hair expands and contracts. This is a Great Lengths exclusive feature. Patented depigmentation process without the use of bleach or ammonia derivatives leaving the strands in virgin-like condition. The only process performed on Great Lengths hair is our colorization process. Great Lengths does not use any toxic chemicals (i.e. ammonia and/or bleach derivatives) in the de-pigmentation and pigmentation process of our hair. The result is colorfast hair that has not been subjected to damaging ammonia and/or bleach chemicals to remove the hair's original color. Additionally, the benefit of this GL patented process goes beyond the Great Lengths hair quality; there is no negative Eco impact from our production process. This point becomes magnified when compared to the significant negative Eco impact created by all hair processing facilities, of which the overwhelming majority are located in China and Indonesia where there are no effective regulatory agencies to monitor such production. Custom applications, masterfully applied, and perfectly blended exclusively by Great Lengths Certified Stylists. A Great Lengths application is more than the high quality hair resulting from patented production processes. It’s about the details of the sectioning and placement patterns, attachment sizes and bond formations. It’s about color placement and color blending. It’s about bringing it all together with a correctly executed cut-in. Great Lengths Certified Stylists have successfully completed the Great Lengths Certification training. The most comprehensive extension application training in the professional industry.